Description: Seaview Transportation, North Kingstown, Rhode Island. GP10 sitting in front of shed on November 12, 2007. Description: Seaview 1855 at Providence and Worcester's Valley Falls Yard. The 1855 on the way to Providence and Worcester's main shops at Worcester, Massachusetts for new wheels and mechanical repairs. Description: Seaview's spotless GP10 rests near the end of the string of spine cars. Description: Remarks: Seaview Railroads "biggest power" works the auto facility at sunrise in the "littlest state". 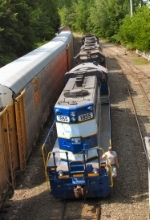 Photo taken by railroad employee on railroad property. Please "shoot responsibly".